Yet, despite the evidence, and being deemed the “blockbuster drug of the century,” patient and family engagement remains the exception not the rule. The Affordable Care Act has increased the incentive for health care organizations to engage patients and families, but health professionals and organizations need practical, concrete ways to do so. Complicating this is the lack of a unified vision within the diverse field of patient and family engagement, which has hindered the translation of effective strategies – from innovation to widespread routine practice. To fill this critical gap, the Gordon and Betty Moore Foundation (@MoorePatient) engaged the American Institutes for Research (@AIRCPCE) to convene a diverse group of stakeholders to forge a unified vision for achieving meaningful patient and family engagement across the U.S. health care system, resulting in “A Roadmap for Patient + Family Engagement in Healthcare.” The purpose of this Roadmap (#PFEroadmap) is to help drive action toward the end goals of patient and family engagement and work towards a transformed health care delivery system—one where patients and families are meaningfully engaged in every aspect of health and health care. 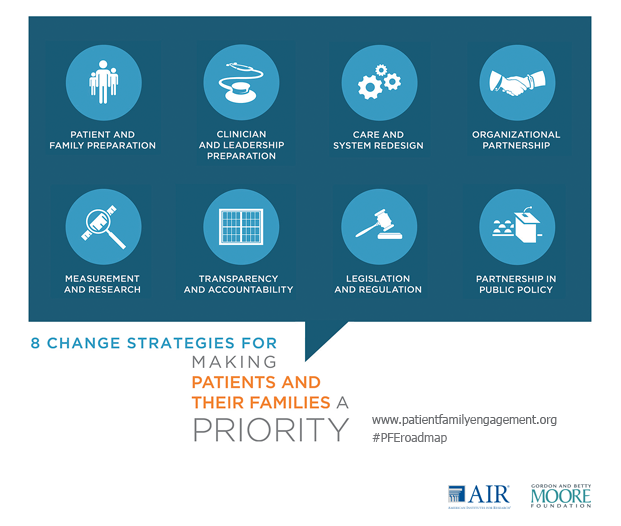 Understanding that true patient and family engagement requires all players in the health system to work together, the Roadmap lays out eight specific strategies for change geared toward the direct care, organizational and policy levels. For each change strategy, the Roadmap provides a brief description of what it entails and specific tactics that can advance the strategy. The tactics are drawn from existing research evidence and promising directions where sufficient evidence may still be lacking. The Roadmap also includes milestones that can help in assessing implementation progress and results. In the next #hcldr twitter chat on December 16, we’ll kick off the first of a two-part series on the importance of and need for meaningful patient and family engagement and what it looks like across the continuum of care. The first chat will focus on how we create shared partnership in the delivery of health care – and the questions we’ll discuss are noted below. The second chat will focus on how we shift the culture of health care to one where patient and family engagement is a norm and not the exception. Leading the first chat on December 16 is Dominick Frosch, Ph.D. (@dlfrosch), fellow at the Gordon and Betty Moore Foundation (@MoorePatient) and Kristin Carman (@kristinlcarman), vice president, at the American Institutes for Research (@AIRCPCE). 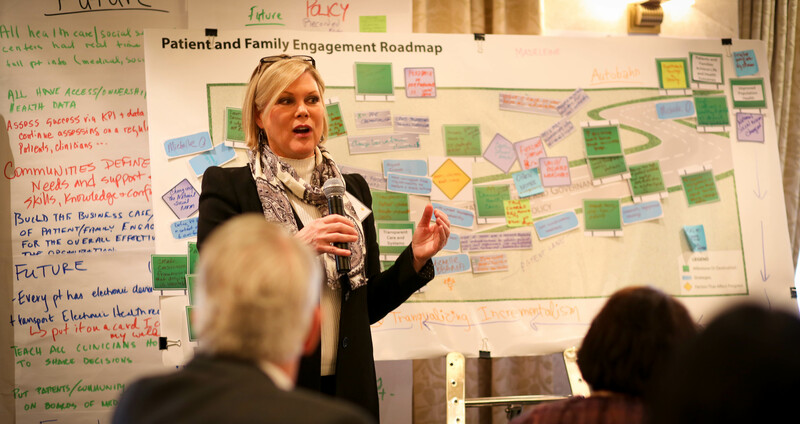 T1: What would our health care system look like if we had true patient and family engagement? T2: What challenges have to be overcome for more patients and family members to be engaged in their health? T3: What support, resources or information do patients and families need? T4: What support, resources or information do clinicians and health care leaders need? ← Do we have patient engagement backwards?